The conservative CDU-CSU party of German Chancellor Angela Merkel is facing its worst ever showdown in years as the Bavarian CSU part wants her to change course on immigration, threatening to split if she doesn’t toughen up. Her new Interior Minister, the highly popular Mr Ernst Seehofer, this week held a joint press conference with Austrian Prime Minister Sebastian Kurz where the two men agreed to toughen up on border control, much to the dismay of Ms Merkel. 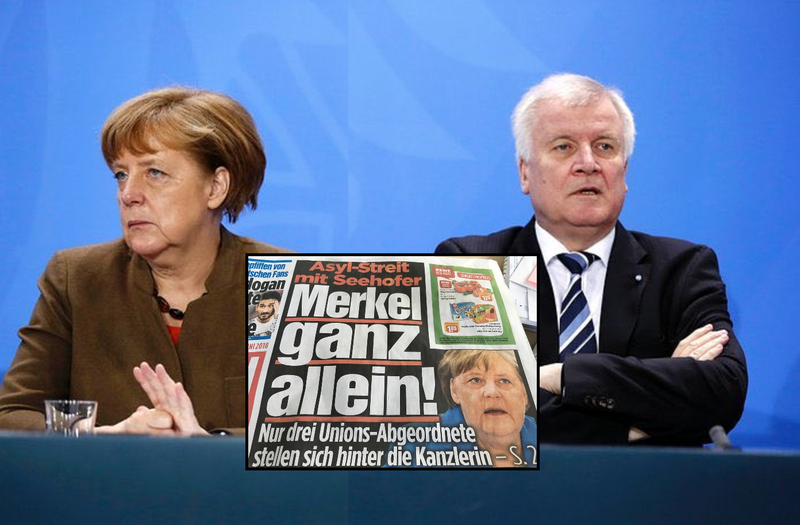 After Ms Merkel criticized Mr Seehofer for doing so, he even toughened his stance further. At that point, emergency meetings between Chancellor Angela Merkel's CDU and the Bavarian conservative CSU were held. At the end of those brainstorming sessions,, regional CSU leader Mr Alexander Dobrindt declared he was "100 percent" in support of Interior Minister Horst Seehofer's so-called master plan for migration. The CSU, which is much tougher and more conservative than Merkel’s CDU, wants to turn away some people at Germany's national border, something which Ms Merkel has explicitly ruled out ever since opening up the border in 2015. Mr Dobrindt however, knowing that the CSU faces elections in October and that the far-right AfD will swoop even more votes if they don’t toughen up on migration, claimed: "As we discussed, parts of the master plan are the direct responsibility of the interior minister, who comes from our ranks." "It cannot prevent us from acting right now and doing what we are allowed to do legally." Chancellor Merkel meanwhile tried to downplay the rumblings of a breakdown in her party, stating: "I expect that we will all do it together, the federal government included." According to the latest German news reports, the Parliament President Mr Wolfgang Schäuble is due to mediate the ongoing fight within the conservative bloc. Hitlers sister is getting hot under her berka! The Soros plan to flood white countries with mudslimes is getting noticed and is not getting the acceptance they were hoping for. Send them back to the $hitholes they came from before they make everywhere a $hithole. Can we hire Hitler's grandson to come home from Argentina and do a quick tidy up? Perhaps if we cloud seed with 'Porky Bits' before hand it may provide a 'target rich' environment!